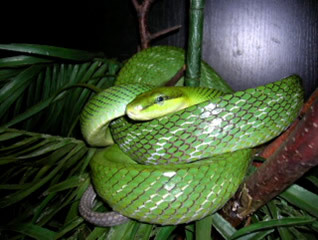 The red-tailed rat snake is a large tree-dwelling snake that grows to more than 2 metres in total length and may, according to some literature, even reach 2.30 m. The dorsal side typically shows a deep green colour whereas the ventral side is lighter green. An eye-catching trait of this splendid snake is the greyish to reddish brown colour of its tail. Closer inspection will then reveal the tongue to be bright blue. It is interesting that regenerating scales are also blue initially before they turn green once more. There are various colour morphs of the red-tailed rat snake, including, for example, grey specimens with a yellowish head, yellowish ones with green head, and even entirely yellowish beige-coloured animals. Some of these are believed to be localized island morphs (Java), but at least the yellowish beige morph also occurs on the mainland of Thailand and Malaysia. Sexes are difficult to distinguish because both possess very long prehensile tails. Males and females furthermore grow to approximately the same size. This genus comprises one other species, i.e., Gonyosoma jansenii from Sulawesi (Indonesia). Gonyosoma require adequately spacious and tall terraria that are outfitted with numerous climbing branches and cork tubes as shelters. The water bowl should be large, as some of my individuals love to spend hours lying in the water. An additional small water bowl should be mounted somewhere in the upper spheres of the terrarium to facilitate drinking; in fact, I have never seen any of my animals drink from the water bowl on the bottom. Using live plants is limited to the most robust of species and even these will be flattened over time by fully grown red-tailed rat snakes. I therefore recommend large imitation plants, which have the added advantage of being much easier to keep clean. A temperature gradient should be made available, ranging from 23 to near 38°C during the day, with the latter value being limited to a localized basking spot. I have noted that the snakes will do poorly if they are continuously exposed to unvarying high temperatures of more than 30°C. During periods of hot summer weather they will spend long periods in the water bowl or retreat to the bottom of their terrarium. Humidity levels need to be elevated to 70-80% by means of misting, which is also when the snakes will drink. The favourite food of red-tailed rat snakes is birds, but they will also take lizards and mammals. It is therefore very easy to keep them on a diet of mice and young rats; some specimens in my care have a distinct taste for gerbils. As I keep the sexes separated and unite them only for the purpose of mating, copulation may take place at any point of time during the year. To date, I have never witnessed their mating, because it always happened during the day when I was not present or at night. Clutches usually comprise 8-12 eggs. These are transferred to an incubator right away. Depending on the incubation technique, and whether temperatures are decreased at night or not, it will take 90-120 days until the babies emerge. Incubation temperatures should not exceed 30°C as this may cause malformation or death amongst the embryos. Hatchlings measure around 45, in some instances even as much as 50 cm in length. It is common that some will not voluntarily feed on mice. These may need to be forcefed, but it is much better if they can be offered chicks of zebra finches, canary birds, or budgies. Baby gerbils or multimammate mice may also produce the desired results. In any case, voluntary feeding is always preferable to forcefeeding! I have noted that hatchling snakes encounter to an increasing extent difficulties with exiting their eggs the older the mother specimen is. It appears as though the density of the eggshell increases in relation to the age of the mother snake, making it hard for the hatchlings to cut through it. The only remedy to this is then to make a careful cut in the eggshell near the time of expected hatching.